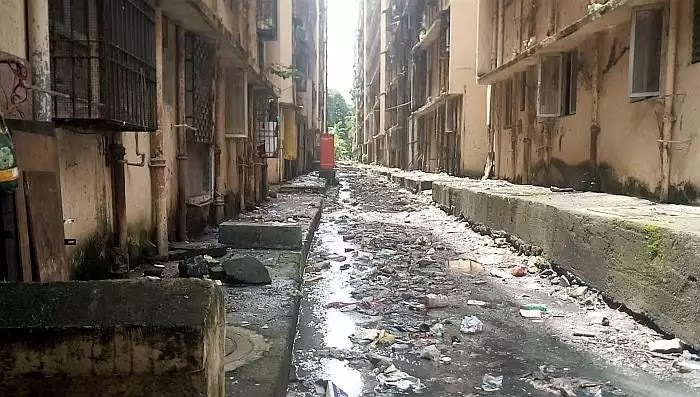 In compliance with a previous high court order, the Brihanmumbai Municipal Corporation had been demolishing unauthorised buildings, including residential and commercial structures along the Tansa Water Pipeline that runs across nine administrative wards of the city. The government had decided to accommodate the displaced persons to an industrial area Mahul but were inundated by a spate of health-related complaints. Over the years, the dismal condition of living standards of the project affected persons (PAPs), the escalating threat to the health of residents of Mahul and neighbouring Ambapada and a surge in skin ailments, lung disorders even cancers, led to loud demands for relocation to a safer option. In 2015, the National Green Tribunal (NGT), Pune too passed an order that said, “…there is a perceptible threat to health of residents of village Mahul and Ambapada due to prevailing air quality in the area”. The issues in question were grave violations of basic human rights guaranteed by the Constitution of India under Article 21 that related to Right to Life. The quality of water appeared “contaminated”; the space between residential buildings was “used as a dump yard posing serious threat to the health of inhabitants,”; a real “risk of water supply getting contaminated with grey water” and Mahul’s inhabitants being forced to keep windows shut due to “excessive spilling of sewage and grey water and foul smell” according to an Indian Institute of Technology (IIT) Mumbai’s inception report on Mahul. IIT-Mumbai even went on to caution the state government that with the slightest change due to any geomorphological event, such as land subsidence or sea level rise, the high-tide line can shift landwards and cover the entire built-up area, endangering human inhabitation made for the PAPs that lies right next to the 50 metre buffer from mangroves in the Coastal Regulation Zone (CRZ) II zone. The risks were real. When Bharat Petroleum Corporation Limited (BPCL) that lies barely a stone’s throw away from Mahul’s MHADA colony, registered a blast and fire at a refinery on the noon of August 8, 2018, it just made matters worse for the PAPs who realised there wasn’t even an evacuation road should any untoward accident occur. Mahul’s residents were like sitting ducks. Those who could avail alternative accommodation had left their ‘hell’ for safer zones elsewhere with families or friends leaving behind the handful few to suffer owing to a dearth of options available. The few suffering, however, weren’t ready to go down without a fight. They surged ahead, voicing their dissent in the loudest manner possible, bolstered by support from Activists Medha Patkar and Bilal Khan who formed the Ghar Bachao Ghar Banao Andolan to help mobilise the Project Affected Persons and litigate for a solution. In the biting cold of December 2018, the Mahul protesters gathered with children and the elderly in tow at Azad Maidan to protest the State’s apathy towards their condition. Day after day, speeches and snacks later, they remained resolute despite their dwindling numbers. They even shifted base from Azad Maidan in the nights to a railway platform on CST before being booted out by the police back to their hell at Mahul but they fought on. And, on Wednesday, their agitations found sweet vindication in the Bombay High Court order. The High Court directed the Maharashtra government to initiate communication with all the eligible persons to be displaced from the pipeline and find out if they would prefer staying in Mahul or take money from the government. The government would then “pay each family Rs 15,000 per month along with Rs 45,000 refundable deposit by way of rent for those persons who choose to forfeit their right to a tenement in Mahul". The families will then have a month to vacate their structures after which the BMC shall resume demolition work. The bench maintained, "The entire difficulty has arisen because of delay on part of the state government to rehabilitate the project- affected persons”. "A similar practice shall be initiated with those persons who have already started staying in Mahul. These persons shall be given the option to vacate the flats occupied by them and take the rent amount," said the court. he court said the government shall deposit a sum of Rs 1.80 lakh (Rs 15,000 per month for a year) along with the Rs 45,000 deposit in the bank accounts of the project-affected persons (PAPs). "After a year, a sum of Rs 15,000 shall be deposited in these persons' bank accounts before the fifth of each month," the court directed. In its order, the court said the government's failure to make available accommodation to the PAPs has resulted in thousands of illegal structures yet encroaching upon the city's main water pipelines posing a risk to the entire city’s population. Now, Mahul resident Sushila Pardeshi will finally be able to avail medical help for her uric acid issue that left her writhing with pain in her joints each time she had to travel from her home in Mahul to join in an agitation against the State government at Azad Maidan along with other project affected persons. And, this time around, leave the toxic hell of Mahul for good!